Go to the competition entry form to send us your entry! We're having a contest! 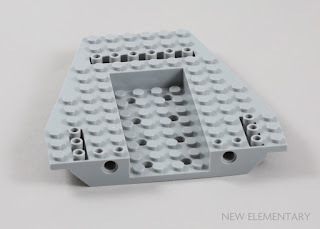 Remember the large new hull element from The LEGO® Movie 2 70821 Emmet and Benny's ‘Build and Fix' Workshop? It was dismissed by many as a “juniorised” POOP part... but what if it actually opens up new creative possibilities? 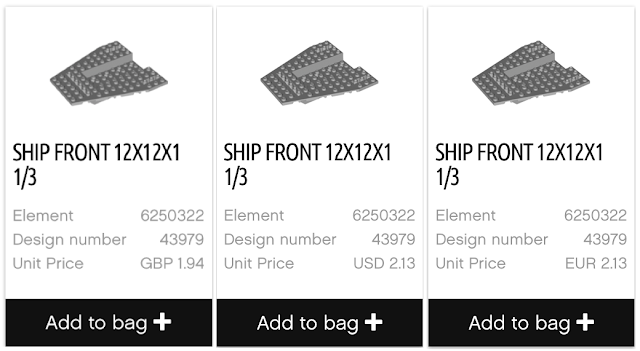 So we're asking you to make an amazing LEGO® creation using this strange new element in our Build and Fix contest; we want you to BUILD something to FIX those negative opinions of this element by showing just how imaginatively it can be used! LEGO prizes to be won! You can build with real LEGO bricks or digital LEGO bricks, but the part which you must include is called Ship Front 12X12X1 1/3 by TLG / Brickset / Brick Owl, and on BrickLink it is called Vehicle, Base 12 x 12 x 1 1/3 with 8 x 4 Recessed Center and 8 Holes. Its Design ID is 43979 and it only comes in Medium Stone Grey (Element ID 6250322) so far, but if you are building digitally you're welcome to choose a different colour. We realise that this is a new element that only appears in two sets at present, so here are a range of options for getting your hands on this part. 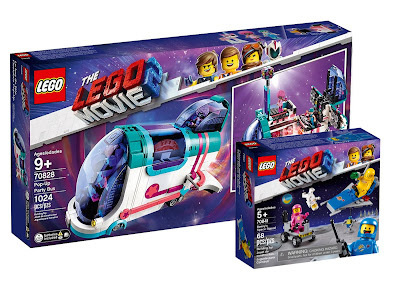 It is available from The LEGO Group's Bricks and Pieces Service for £1.94/ $2.13/ 2.13€ if you reside within the range of countries that can utilise this service. It is also available on BrickLink and Brick Owl as a single part for sale on the secondary market. You don't have to own the part though, thanks to our friends at community digital LEGO design platforms! 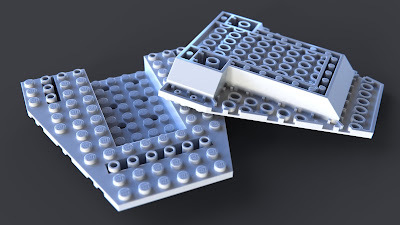 This new part is already available for you to build with on LDraw, Mecabricks and Studio. Thanks to everyone who has kindly helped to ensure that this new part is available digitally! 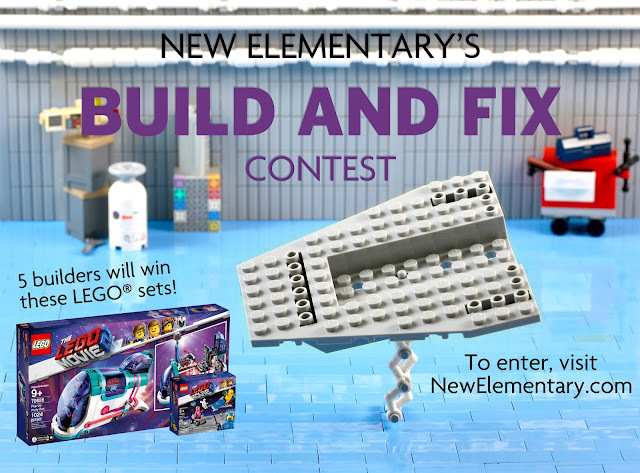 The contest is run by New Elementary with support from The LEGO Group. New Elementary is not associated with The LEGO Group. LEGO® is a trademark of The LEGO Group of companies which does not sponsor, authorize or endorse this site. All text and images are © New Elementary unless otherwise attributed. I built a spaceship using this part a week or two ago and uploaded pictures to Flickr. Can I enter that in the contest, or does the build have to be started and completed after the contest announcement (that is, today)? That's okay. Thanks for checking! The one image per entry must be a single framed shot, right? It can't be a composite showing the creation from different angles? Correct, thanks for checking, I will update T&Cs. Does the part have to be in Light Stone Grey or can it be any colour? 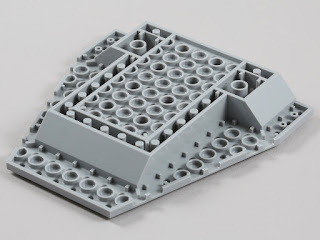 Since the seed part is a POOP, is it alright to build the model using a nearly identical stand-in built out of other parts, or only using the exact seed part? I like building physically, but I don't have the part. Thanks! No - it's essential the seed part is used. 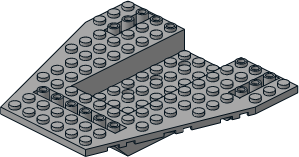 This really is a tricky one...there's not a lot that can be built with this that couldn't be built wihh smaller parts do really justifying the part beyond ease and stability is tough. Agreed, we are hard taskmasters. We ask a lot of our poor readers! If I build digitally can I use any part in any color? Even parts that doesnt exist in the given color? Yes, including the seed part. The “best picture of the seed part” need to be a picture of the angle in which you can see it the best or a picture on which it looks the best? Both in a way. We're interested in how you've used it. So probably the latter, so long as we can see it. Ah yes I recall this piece wish I had one for my son. I built a long space ship with large blue wings with red layer wings to add flare of course as a kid I built 7 rocket boosters with flames. This element is a new element for this year. You and your son should have a go at building something cool for our competition. I commented on your Instagram recently to say I was still waiting on my bricks and pieces order to arrive with the parts... due to lego having a shipping delay. You said over there you may extend the contest by a little bit to allow the unfortunate entries of people left waiting by lego. Any chance you've decided on this. I have all but the seed part now built and I'd hate to see my efforts go to waste. Please consider extending atleast to the end of March. Ah ok, Nick's arrived so I hoped yours had as well. Have they given an indication or can they not tell you that? They have (finally) shipped today. So based on past experience it will be between Friday 22nd and the Tuesday 26th. Is there any place where I could find all entries? I didn't find anything, but I'm very interested seeing tge ideas for this ugly piece.. I was just about to ask the same question. 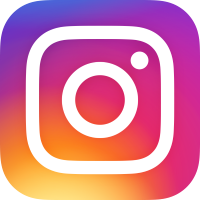 I have already seen a couple of awesome designs mostly on Instagram.